Steel Elbow, offered by us, is made from quality materials that ensure durable finish. We manufacture the Steel Elbow at our own unit by utilizing well-tested methods. Quality approved steel and the latest techniques are used for manufacturing the elbow. These Steel Elbows are available in various specifications in order to meet the diverse requirements of the clients. 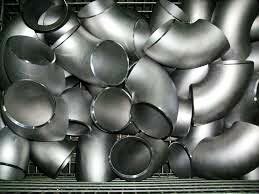 Buyers prefer to buy Steel Elbow from us as we make it available in small as well as bulk quantities. We offer Steel Elbow at competitive prices.